Penny the Chihuahua was brokenhearted on Sunday after she gave birth to a single, stillborn puppy. "She pretty much cried all night and needed to stay with somebody," one of her dads, Dale Fulk, told local outlet WHSV. "And you could see the tears, literally she had tears coming down her eyes." That's when they reached out to Cat's Cradle, a rescue in Harrisonburg, Virginia. "We said we've got baby kittens," Matt Chan, the rescue's adoption and volunteer coordinator told The Dodo. A few days earlier, Cat's Cradle had taken in five newborn kittens from the county shelter after their mother stopped caring for them. The kittens were with a foster family that was bottle-feeding them, but when Fulk and Mullins called, Chan got the idea to match the kittens up with Penny. 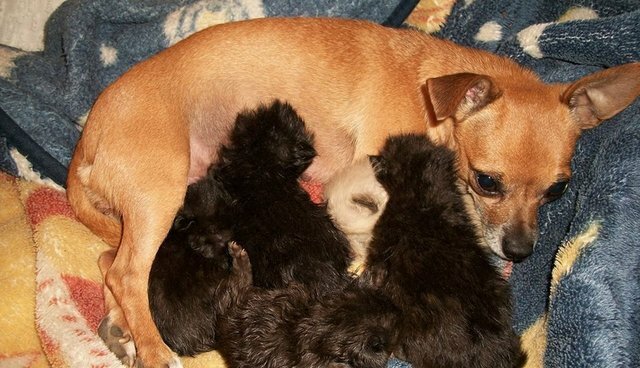 "This is the first time we've ever done it," Chan told The Dodo, but matching the kittens with a mama dog worked perfectly. Penny took to them right away. "It gave her what she was looking for; it was almost immediate that she turned around 100 percent," Mullins said. As soon as the kittens are old enough, they'll say goodbye to their adoptive mom and go off to new homes. And Penny will be spayed - so her kittens will be the only babies she'll ever have. 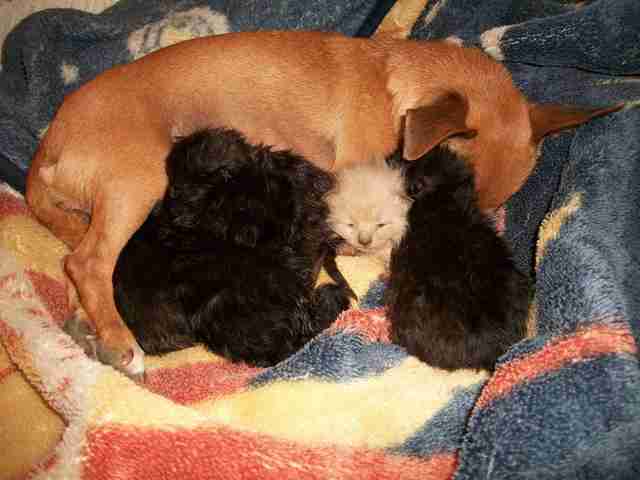 Penny isn't the only the dog to adopt kittens in need - this pit bull nursed an orphaned kitten until rescuers arrived.